Advice: Invest at lower levels. Target – Rs 800 in 24 months. BGR Energy is a leader in the Power Plant EPC space. However the industry headwinds have pulled down the business performance. BGR shares have fallen sharply to current under priced levels, and may stay around these level for 2 quarters. Thereafter the stock is expected to rise and recover lost ground. Warning – Extreme volatility – this stock is not for the faint hearted. BGR Energy is primarily a Power Sector focused Engineering- Procurement- Construction (EPC) company. It builds Power plants for Utility companies and commissions and hands over the plant. It is Chennai based, with 2010-11 revenues of 4747 crores; market cap 1894 crores and 2200 employees. Power Plant work can be in a Turnkey EPC mode, responsible for entire plant, or BoP (Balance of Plant) other than the BTG (Boiler Turbine Generator), or only BTG. BGR has domain capabilities in power, and the ability to plan, design, procure/ build, execute and commission projects. Thus experienced personnel are the main resource of this firm. Shareholding pattern is: Promoters – Individual and Corporate: 81.1%, DII 5.1%; Bodies Corporate 1.9%; Individuals – retail plus others 11.9%. Thus Promoters hold significant stake – a good sign. By nature, the firm is paid in terms of milestones achieved in the project execution, so revenues tend to be lumpy. Also the Orders booked for this firm as a proportion of current revenues indicates the safety and visibility of the current business. BGR has extended its offerings to other verticals like Oil & Gas, Electrical projects (substations), environmental engineering projects and air fin coolers. Other group companies – Progen Systems – focuses on Design and manufacture capability for Process equipments. Also Cuddalore Powergen Corp Ltd is setting up a Power Plant. It can be seen that BGR is over time going to straddle the entire Power Generation lifecycle, from BoP to EPC to BTG/ key components manufacture, to the Plant Operator (Generation) and the Utility play. The key players in the Power Plant EPC market are NTPC, BHEL, L&T, and AIA Engineering. But it is a crowded market. The competition also includes Reliance Infra and Tatas. Sub-segments are BoP and BTG manufacturers. Chinese manufacturers of BTG have a price advantage in India compared to locals. This anomaly should soon be corrected by the government. The government has just come out with an order compelling open access, in line with the Electricity Act, 2003. This will allow all consumers of >1 MW freedom to choose the supplier, and only inform their current distributor. This will be a game changer for the Power industry if correctly implemented. BGR Energy had its IPO in Dec 2007. In a blockbuster offering, it was oversubscribed 119 times. Hoping to generate 438 crores, they attracted 52,000 crores. However, from its IPO price of 480, it has now fallen to 269 a fall of 14% per year. See Fig 1. As compared to share price, we can see that in the last 4 years, sales have grown at an average of 57% CAGR. 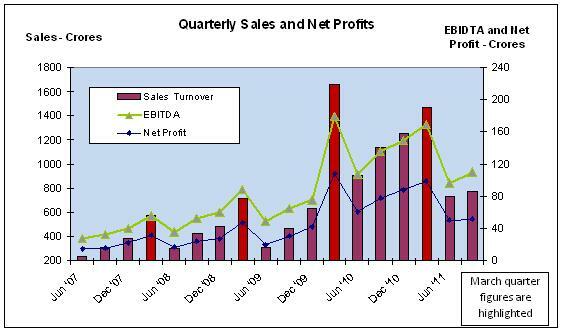 See Fig 2 – Quarterly Sales and Profits. Both EBITDA (53%) and Net Profits (69%) are growing rapidly. 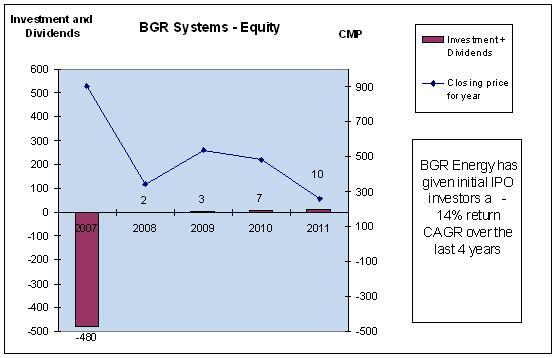 We can see from EPS and Cash Flow – Fig 3, the unevenness of the business model of BGR. Cash flow is unpredictable and lumpy. 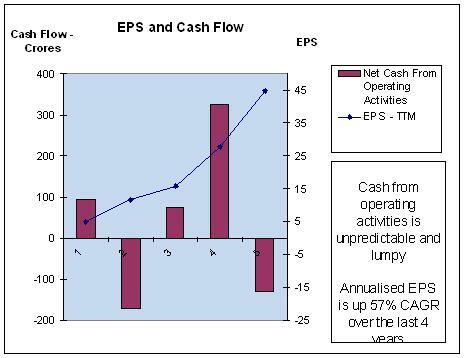 EPS however is growing fast at 57% CAGR. Again this is a good data, but from a low base. Debt is the big issue with BGR. It has increased significantly in the recent past. Gross Debt also stems from two sources – Net working capital and Debtors. Working capital increased from 103 days (end FY11) to 206 days (end 2QFY12). This could be due to execution delays across the ongoing projects. Debtors went up from 243 days (end FY11) to 341 days (end 2QFY12). This was due to a sharp rise in Retention Money, which was 1300 crores (end 2QFY12). Of this 900 crores is due to projects under execution and 400 crores against completed projects v/s 1100 crores (end FY11). Retention Money is generally Bank deposits/guarantees for performance on projects. The completed project Debtors is certainly payment issues faced from some customers, possibly State Electricity Boards that are themselves in financial stress. 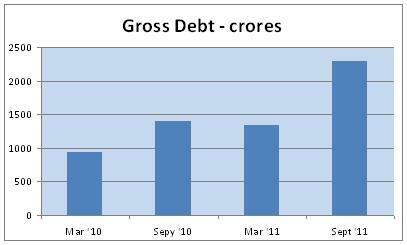 BGR expects debt to fall from 2300 crore (see Fig 4) to 2000 crores by the end of FY12 as the retention money is realized. And Debt equity is expected to increase from 1.4 (FY11) to 2.0 (FY12 Estd). 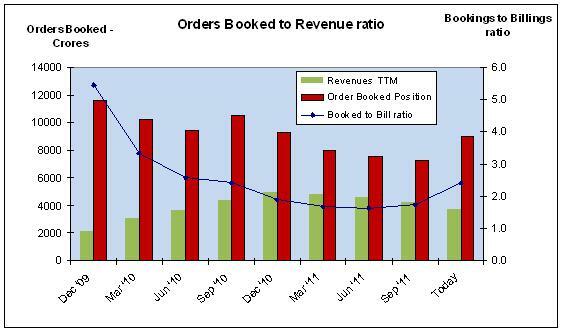 An important ratio for BGR analysis is the Orders booked to Revenues ratio (BTB). This has shown a cyclical nature, and by indications, is on an upswing now. The financials and PE of BGR has been projected for the next 3 years. See Exhibit 6. The current PE of BGR Energy is 6.7, below the industry average of 9.9. The average PE in the last 4 years has been 17.5. Certainly today BGR is at the lower end of the pricing range. 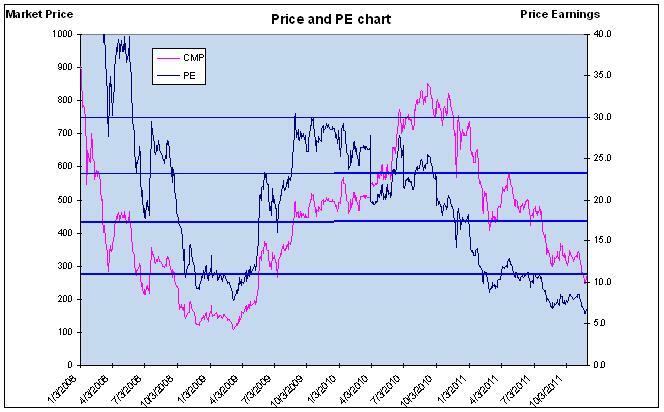 The Price and PE chart Fig 7 – shows that the successful IPO gave big valuations, but this fell rapidly in the 2008-09 global financial crisis. The view of the EPS chart – Fig 8 shows that EPS continued its rise thereafter, and the share price smartly recovered, only to fall again in this current situation. Certainly the fall in share price is very steep compared to EPS, so the share is today underpriced. 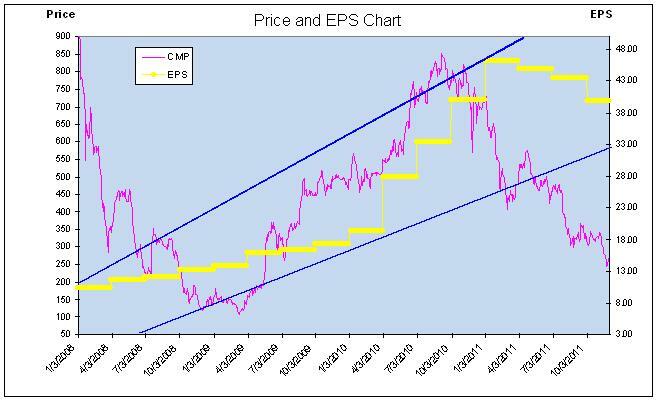 The EPS of BGR is on a growth path, and is expected to stay in the defined Trend line range. Industry: 3-4 years ago the Electricity sector was the darling of Entrepreneurs and Investors. The yawning gap between demand and supply gave a demand assurance. Investors believed that they will be able to sell power at Merchant rates, and planned for large generation addition. Government too encouraged this with the Electricity Act, 2003 that threw open the sector to Private investors. Today systemic flaws are appearing in the sector. There is financial stress among Utilities, particularly State Electricity Boards that are facing Tariff inflexibility and Collection issues. Power Plants in India are facing an issue with fuel linkages and a shortage of Coal/ Natural Gas. This has affected the investment climate in this sector. The projects under execution by BGR may also be affected, and execution/commissioning may be delayed. See Notes on Petronet LNG and Bharat Forge. Project execution delays due to government clearances like environmental, land acquisition, etc. BGR: BGR is certainly facing a shortfall in Order Bookings due to this environment. However, as seen in Fig 5 this is reversing, and we expect recovery in the next 6-12 months. Vertical focus Risk, as revenues are essentially from the Power Gen. vertical. However, this is being addressed by BGR extending its EPC, manufacturing and technology strengths to other verticals. In Nov10, BGR was in the news for a Finance bribery scam. The company clarified that it has no dealings with LICHF and Money Matters, and cooperated with the authorities. In Oct 2011, BGR received a notice from the Central Excise Department, for tax evasion of Rs 107 crore. The company is confident that it has not evaded taxes, and will clear these charges. India has a surging growth in electricity demand, and there is a 9-13% power deficit today. This will widen in the next few years. As a leading EPC company, BGR’s fortunes are closely linked to the improvements in the regulatory environment and overall industrial climate of the Indian power sector. In a stable environment, BGR should perform excellently based on current skill sets and manufacturing and execution capacities. The core undeniable strengths of BGR will take around 2 quarters to emerge in the form of business metrics like Orders booked, billings, profitability and EPS, as the government addresses industry systemic issues. BGR also needs to repair the Balance Sheet and manage the debt levels. A good sign is that Merchant power rates are now on the upswing in India. FY2011 was an excellent year, and BGR will not be able to show any significant improvements in FY12. However the demand gap will catch up, and FY13 will be a good year for BGR. BGR is a High Risk, High Gain stock. Share may even fall from current levels. Investors with a risk appetite and a 2-3 year time horizon can accumulate BGR at 220-270 levels over next 6 months. The 24-month projection (Sept 2013), for BGR is Rs 800, a 310% appreciation from CMP. Good research bro,hope your targets r acheived within 12 months instead of 24.